Home » attraction » East Java » The Reasons Why Should Visit Surabaya Before You Die! If you have hobby travelling, I recommended you to come to Surabaya. I know you are curious why I recommended this place. Surabaya has many places that you can visit. Surabaya is friendly city, but it is not big as Jakarta. In Surabaya, you can go to several malls. If you have children, don’t worry. You can go to malls that have children playground. Do you like to try traditional culinary? If yes, I also suggest you to come to Surabaya. Surabaya is famous with their traditional food, such as Soto ayam, Rawon, Nasi bebek, Lontong Balap and many others. 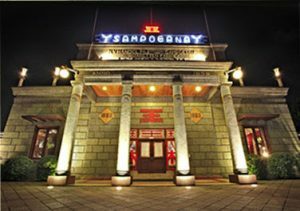 If you like to stay, there are many hotels that you can choose in Surabaya. The important things why you should visit Surabaya are there are many places that you can visit during your travelling. Well, here are the reasons why should visit Surabaya, East Java Indonesia. Mesjid Chengho is the first mosque in Indonesia. It is used Chinese Muslim name and this is a religious place.The name of this mosque is derived from the name of Chinese admiral, Zheng He. He is a Muslims. He took a trip to Asia Southeast to carry out various missions, including trade, make friends, and spread the teachings of Islam. Construction of the mosque Zheng, also known by the name of Muhammad Cheng Ho Mosque. The process takes one year and had completed all the parts in October 2002. 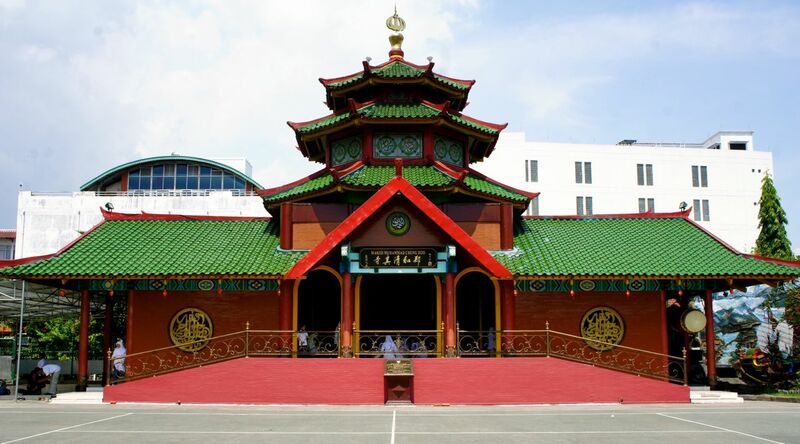 The mosque was established based on the initiative of the elders , advisors, board of Pembina Imam Tauhid Islama (PITI), Yayasan Haji Muhammad Cheng Ho Indonesia Jawa Timur, as youll as the Chinese community leaders in Surabaya. Mosque complex built on a land area of ​​3,070 m2. 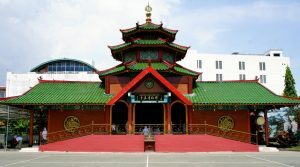 The combination of Arab and Tiongkok become the hallmark of this mosque. The rest of this mosque combines Arab and Javanese architectural styles. Architectur Mesjid Chengho in Surabaya is Abdul Aziz.. So you don’t have to worry if you visit or stay near this place. Besides actively used as a place to celebrate Idul Fitri and Idul Adha, various social activities such as the distribution of cheaper grocery, blood donors also often held here. In the Kampung Arab Ampel itself, assimilation and acculturation has occurred since a long time to form a new culture. This is because in the village, there are several ethnic blend into one. Among of them are Arabic, Chinese, Banjar, Madura and Java. In carrying out its culture, a combination of each ethnic culture was fused and mutually adjust acculturation include a variety of things including language, which is now called the Ampel language, and for food and wedding tradition, it follows the Arab tradition. Talk about Kampung Arab certainly can not be separated from Religious Tourism Sunan Ampel. 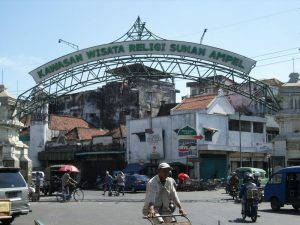 In addition to the mosque, which makes this Ampel Arab village crowded by visitors is the tomb of Sunan Ampel located on Cemetery Sunan Ampel. These are the reasons why should visit Surabaya, East Java Indonesia.. When visiting Kampung Arab Ampel, you should not forget to shopping trips. Here you can buy a wide range of accessories and products that have same characteristic with Middle East, such as kajal and Siwak. This place also sells various kinds of Muslim clothes, gloves, koko, religious equipment, etc. In addition to shopping trips, you also can all enjoy Arab food, such as bread Maryam, kebabs and Arabic pukis that is sold by several vendors in the aisles around the Ampel Mosque. If you want to feel more Arab food, you can visit some of the restaurants or eating places that are scattered around the area of Kampung Arab Ampel. Arab food include various processed goat is thick with typical Arabic spices, curry green beans, tomato rice, nasi briyani, and nasi kebuli. Additionally, you can also taste the popular shisha or Arabic cigarettes. You may also visit Restaurants In Surabaya for Perfect Dating. When entering the complex Museum House of Sampoerna spacious, you can see several large buildings in colonial style. A security guard stationed in the first building, which is used as a Café. Front view of Museum House of Sampoerna with large majestic pillars. This house was built in 1862 and originally used as an orphanage. It was managed by the Dutch government. After that, this place was bought by Liem Seeng Tee in 1932. You also can go to Café in Sampoerna Museum. This café has unique style. You can try culinary from western dish to Asian dish. In addition, in this place also there is live music. Open Hours: Everyday 9.00 a.m – 10.00 p.m. So, do you interested to visit Surabaya? There are many beautiful reasons why should visit Surabaya, East Java Indonesia.